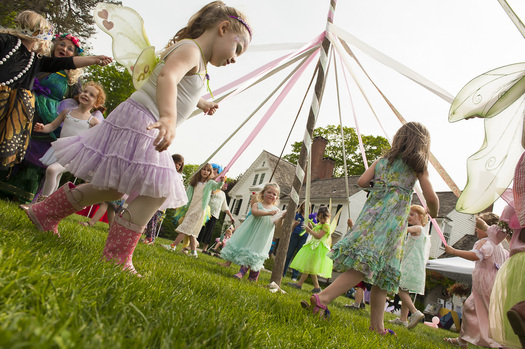 Bethlehem, CT - Calling all fairies, elves, pixies, and woodland and mystical creatures – as well as regular folk – for a day of enchantment and delight at Connecticut Landmarks’ Bellamy-Ferriday House & Garden! Get your passport to the land of magic, art, and music and join us at the maypole on Saturday, June 16th from noon to 4 pm (rain date: June 17th). Enjoy tea with a fairy godmother and stroll along the woodland walk to build a fairy house. Visit the vendors at the craft fair, make ribbon rings and fairy globes, and participate in a fairy and wizard parade! Sprinkle fairy dust on cookies at Tinkerbell’s cottage, bounce in our bounce house, and enjoy face painting, balloon twisting and pony rides, along with entertainment in the fairy ring theater. All for one admission price! both adults and children. Registration required for fairy house contest, entry forms must be submitted by Sunday, June 10th. Completed fairy houses must be delivered to the Bellamy-Ferriday House & Garden on Thursday or Friday, June 14th or 15th from 12 to 5 pm. For entry forms and official rules, visit www.ctlandmarks.org. Food & drinks will be available for purchase from the Soroptimists of Greater Waterbury and the Bethlehem Lions Club. Admission is $12 per adult, $7 children (3-12), 2 and under free. The Bellamy-Ferriday House and Garden is located at 9 Main Street North, Bethlehem, CT. It is open for tours May through October. For hours and more information, visit www.ctlandmarks.org; https://www.facebook.com/BellamyFerridayHouseGarden; or call 203. 266.7596.